Oh crap. 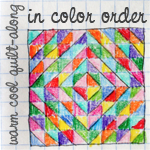 I'm *so* tempted to do this as it's one of my all time favorite patterns. I already have another finished quilt top like this I need to quilt but, but, but... It's so CUTE! That's what Heather (http://quiltorstitch.blogspot.com/) is for! She's making one and almost has me convinced to make one with her. You are *not* helping either dangling your Accuquilt in front of me! lol The two of you... I feel so ganged up on. Heehee.